So then, being the mechanical engineering major I am, I started looking at the design, and was like, I can build that (and probably cheaper)! So then I started drafting out possibilities of reusing an old bike chain + gear system with a box and spinning cylinders. And it all would work out great if I knew how stiff the metal teeth are in a drum carder that way I can find the right material (wire?) to wrap around the cylinders. If any of ya'll have a drum carder and can point me in the right direction, I would greatly appreciate it. 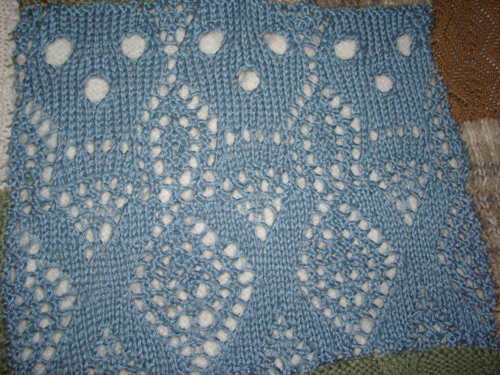 Its knit in the round, the chart is completely my own (If anyone wants it, PM me). The yarn is Elann Peruvian Highland Wool. The scarf, fringe and all. Okay, this took a ridiculous amount of my time over this weekend, and i think it caused me to get a cold. but I love it all the same, and it will soon become my poster for my job! Original size was 4000 x 3000 px. If you click on the picture, a much better version will pop up - it was resized here. Comments will make my day! If this is the wrong forum for this, please let me know. But, to me, this is a "fine art". So I improvised: I found an angora sweater from the nearest goodwill in Baltimore a couple of weeks ago for only $2. What a deal! you can't even buy one skein of angora for that price. So, that's really soft. And that green could go with the kureyon, and I'll make the part that goes over the ears be really soft, but the part that is on top of the head could easily be the kureyon. 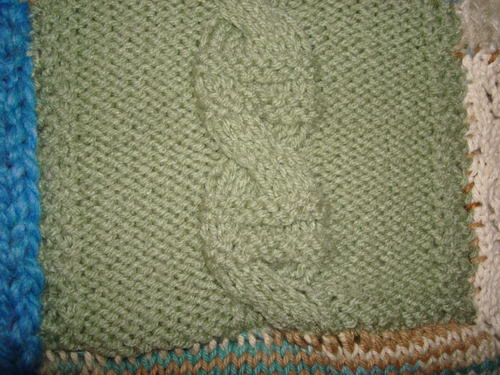 So, I changed color/yarn for the center part. i think it turned out well. Comments will make my week. I've had an extremely weird week. 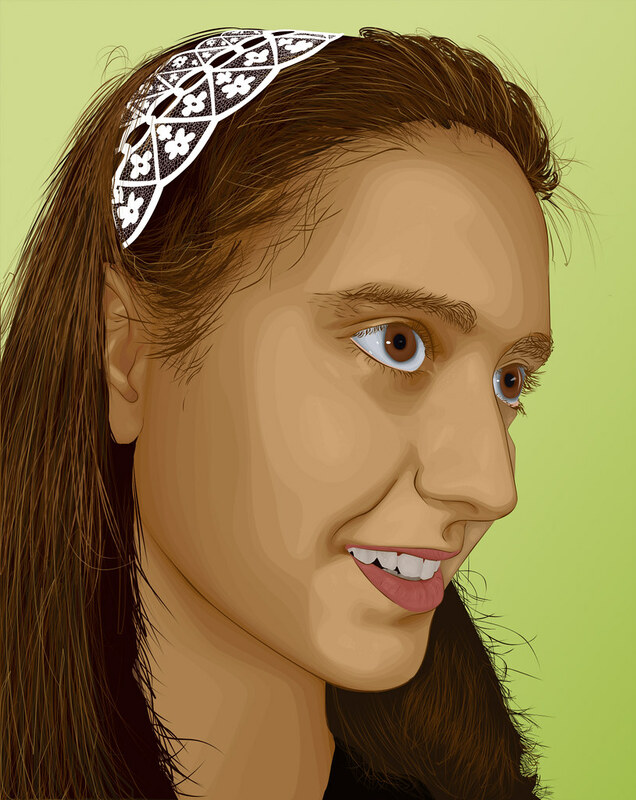 Okay, so I jumped on the Danica bandwagon. 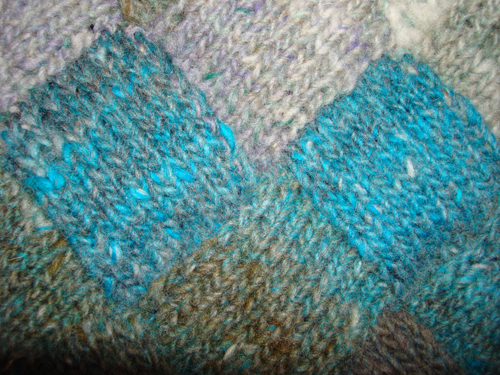 I used my first expensive yarn, Noro Kureyon, in this project, though. 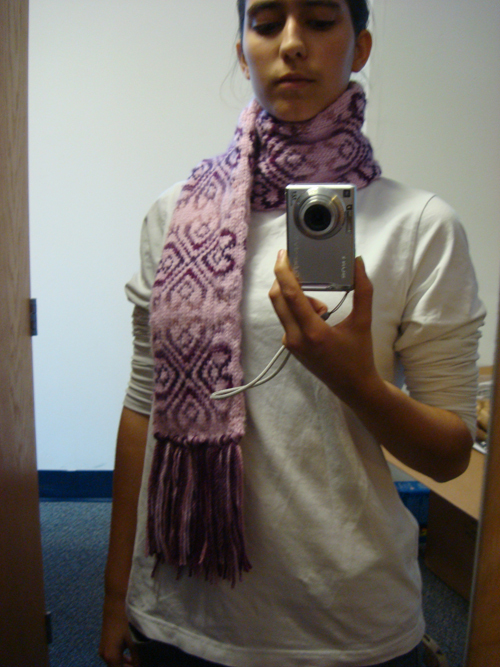 I got a good deal through eBay (the wonders you can find...) This scarf is about as tall as I am (it's 5' and I'm 5'3"). So, this was a great way to procrastinate that awful calculus homework. So this has been finished for several months now, but its been packed away. 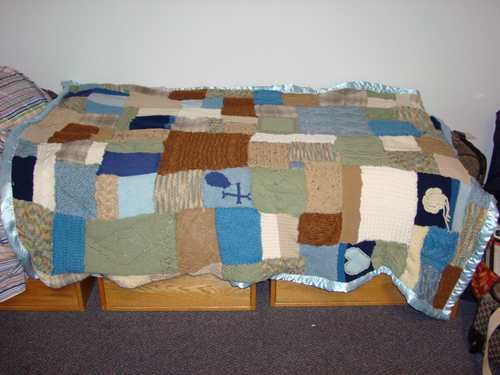 now that I'm finally at college and all moved into my dorm room, the quilt just begged to be posted. In my English AP class we had to have a senior project, something to reflect on your senior year of high school. 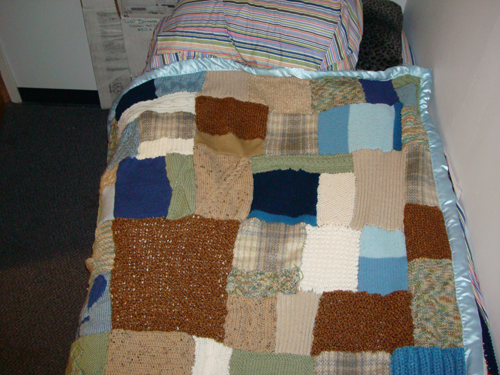 So, being the obsessed crafter that I am, I decided to knit a quilt that I could use for college. The teacher was just thrilled with it (if anyone's interested, I got 100% on the project. the class is notoriously hard, and only, like, 5 of us got 100% out of about 100 kids). Skull & Crossbones Lace. This was my equivalent to Heart of Darkness. You see, when Marlow gets stranded and really really needs rivets to hold his crew together, yeah, this is that. Oh, and the heads on the posts too. I don't know if you can tell, but i totally screwed up the crossbones and had to pay attention like crazy afterward. Skull & Crossbones Intarsia. Can't you tell i'm a pirate? 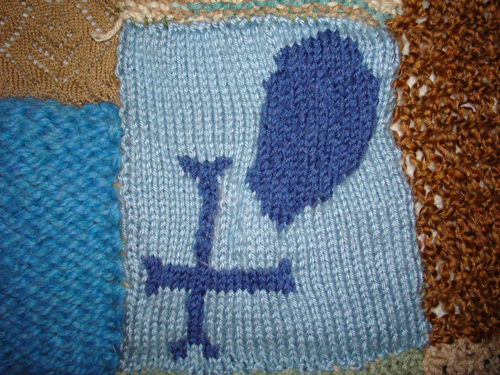 I drew this out on graph paper, then shaded in the squares that I had to knit in the darker blue. 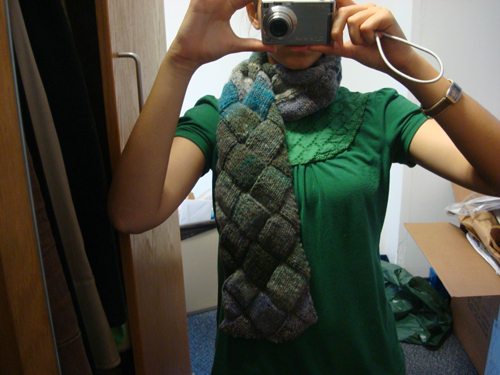 Needless to say, I couldn't quite work the whole bobbin thing, so its kinda mangled. its really quite bumpy, but pirates aren't perfect. Egyptian Cable. I was just experimenting, and I thought this one felt kinda egyptian to me. I dunno why, but its one of my favorite squares. Anchor panel. This was for Hemingway & The Sun Also Rises. Not only was Ernest Hemingway an avid fisherman, but his novel, The Sun Also Rises, firmly anchored my grade in the class at an 85% first semester. I got a whopping 17/50 on the test. great job, huh. (edit) So I forgot to mention.... the entire thing is backed by really really soft fleece. its warmer than anything. 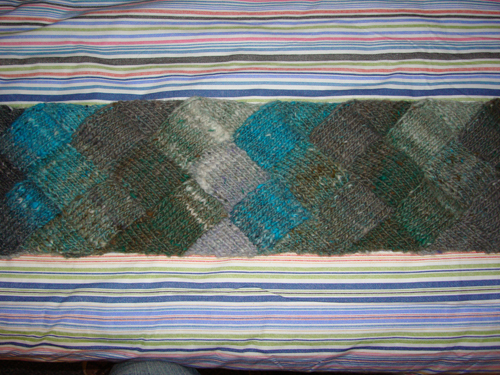 I completed the whole thing in about 6 months while documenting every stitch that I completed. It was a lot of work, but totally worth it for my first real winter. and thanks for all the nice comments so far. I'm a poor college student, so most of my yarns come from frogged goodwill sweaters. This was one such sweater. I'm not a fan of pink, but because this was 100% italian silk, and half off, I had to get it. I promptly frogged it and saved the silk. 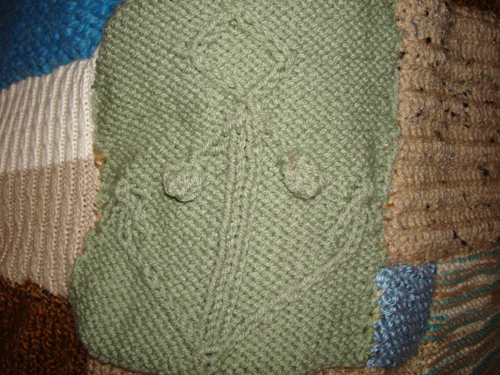 i then flipped through the latest knitscene issue, and found the 2 over 2 cable vest and decided that the silk would be perfect for it, and that it would be a great gift for my aunt, who just graduated from UMass. 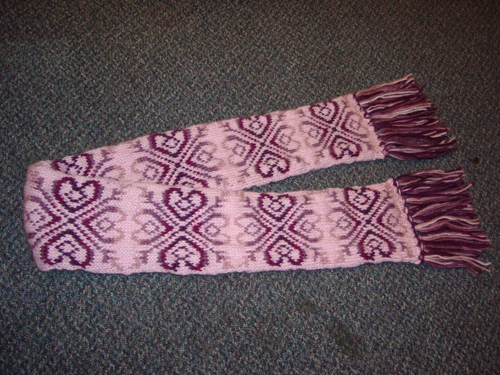 I made the size small, but my gauge was bigger than the pattern stated, so it was the perfect size for my aunt. 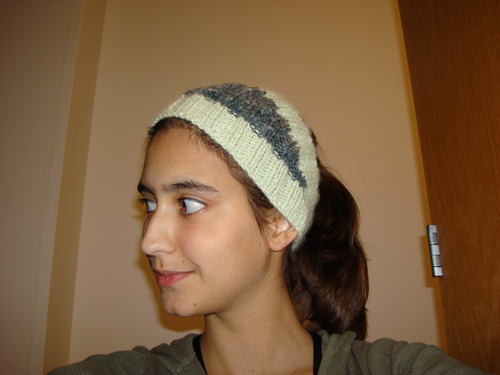 The pattern is really easy to follow, there's no shaping, and the hardest part was seaming up the sides. 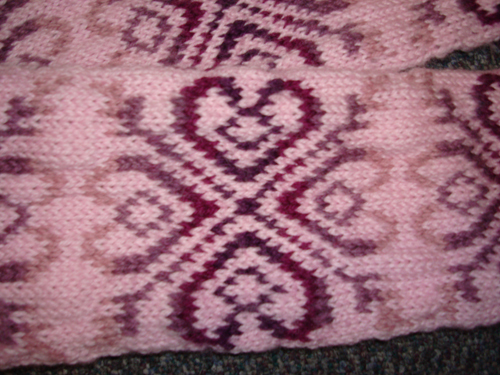 Although, the pattern could be easily modified to be knit in the round. It was pretty easy to make. All I did was cut a section off the top, gather the remaining material and sew it to a ribbon, then I sewed the top to the ribbon and inserted the zipper. the whole thing is lined.